The general consensus is that interest rates will rise. But the key question is when. We believe that owning insurance companies provide a natural hedge against rising interest rates. Generally speaking, rising rates cause trading multiples to contract for most companies. However, as we wrote last year about a potential “A Golden Age for Insurance Companies”, rising rates interest rates should ultimately lead to higher earnings and higher ROEs off-setting the multiple contraction experienced in trading multiples. It’s clear that interest rates, i.e. the 10-year, have a huge impact on stock market valuations. Putting this into perspective, we are sitting at about 2.41% for the 10-year. As one can see below, we are at the low end the cycle. Interest rates are bound to rise at some point. As an investor, one of the impacts of rising interest rates is that the risk-free rate goes up, causing the P/E multiple to come down. 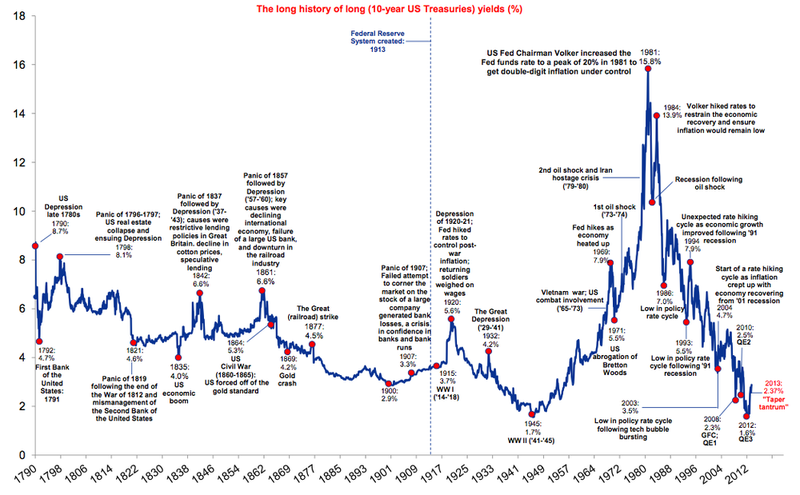 Historically, the development of interest rates and P/E multiples have been as follows. The chart below shows average monthly P/E ratios versus the average monthly 10-year Treasury yield over the last 50 years. So it’s clear, when interest rates rise, generally speaking, there is downward pressure on P/E multiples. Now, let’s go back to Warren Buffett’s comment. If interest rates do not rise for the next ten years, you may be missing out, as the current Shiller cyclically adjusted P/E of roughly 30 implies a 3.33% return (excluding growth) versus a long-term interest rate on a bond of 2.41%. However, if interest rates do rise, the P/E multiple is likely to come down. Now, let’s say that is goes to it’s historical average of 16.75x. This implies that, all else being equal, companies would be trading at 44% discount/lower than the current level of 30. At S&C Messina Capital, we do not tell our investors to have all their eggs in the P&C insurance market. However, we do feel that putting aside a portion of one’s wealth should be invested in this sector, as it provides a natural hedge against a potential rise in interest rates. If nothing happens, i.e. if interest rates stay the same, our companies will still continue to earn money on their underwriting & investment results. If interest rates do rise, our P&C insurance companies will earn (a lot) more money on their cash & bond portfolio, all else being equal (i.e. underwriting profitability remaining the same etc.). Another caveat is that book values may not rise in the first couple of years as it takes time to turn over the portfolios owned by the P&C carriers; in fact book values of the existing bond portfolio will decline initially as rates rise. But as new bonds are bought in a rising rate environment, ROEs will catch up and rise as well. For more information, please read our earlier post “A Golden Age for Insurance Companies”.